Earlier this year, when I made Gingery Pork & Chive Pot Stickers, I declared 2014 The Year of the Dumpling. 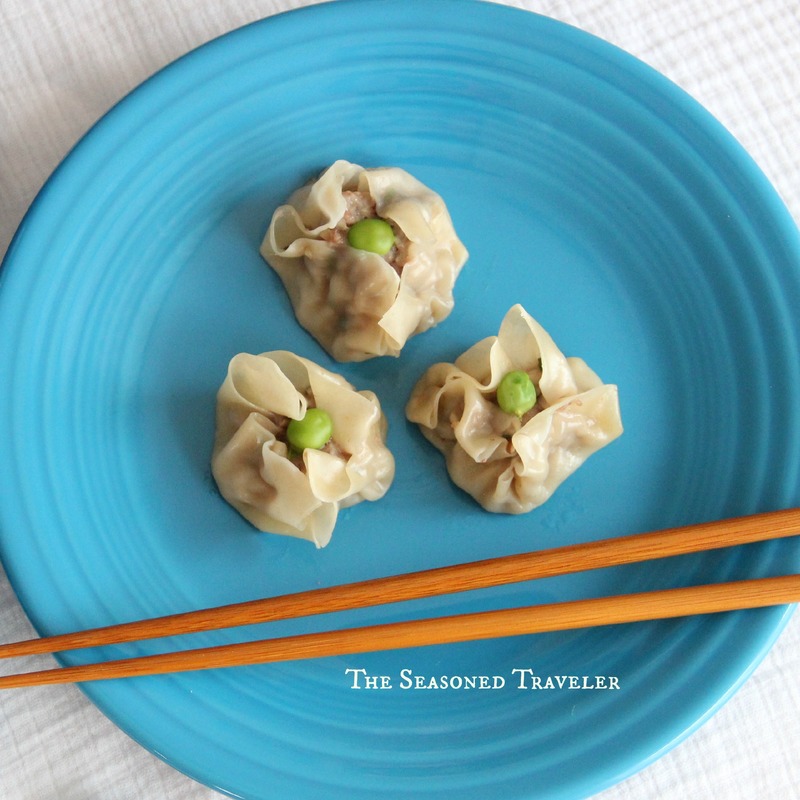 As a second foray into making these bite-sized morsels, I tackled another favorite of mine, shumai (in Japanese) or shãomài (in Chinese). 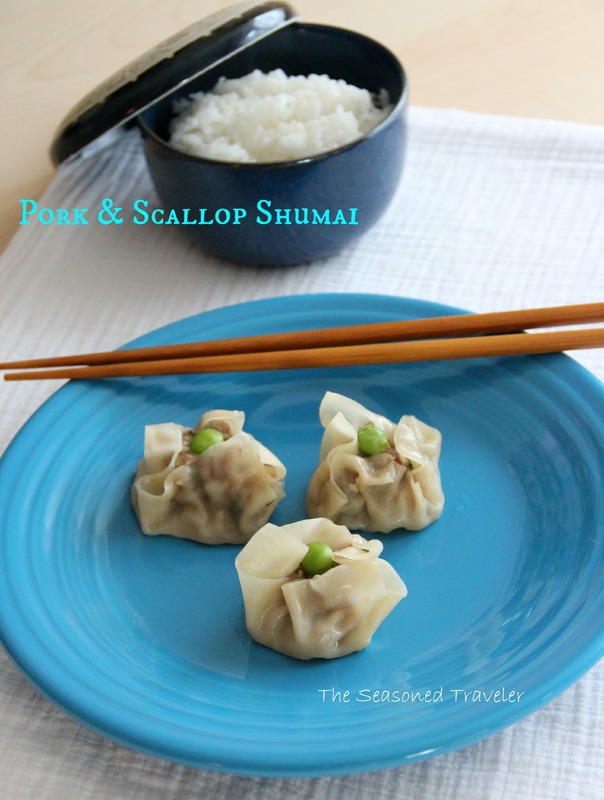 I roughly followed Andrea Nguyen’s lovely recipe for pork-based dumplings (from her exquisite Asian Dumplings cookbook) except combined the pork with scallop to create more of a Yokohama-style shumai that I loved from my time in Japan (true Yokohama style also uses shrimp in the mix). These pretty little parcels are just bursting with flavor in each bite. The shiitake mushrooms lend a real earthiness to the rich pork and scallop filling, while chives, ginger, and white pepper (and the hot mustard in the dipping sauce) add subtle spiciness. A crown of little garden peas add a fresh seasonal touch; you could also use finely diced carrot on top. For Fiesta Friday this week, I’m bringing a basket of these dumplings, a little dim sum for everyone. Happy Weekend! Combine the first part of the filling (mushrooms through pork) in a large bowl. Use a fork or spatula to stir and lightly mash the ingredients together. In a small bowl, stir together the salt, sugar, white pepper, cornstarch, soy sauce, sherry, sesame oil, and egg white to combine well. Pour over the meat mixture and stir, fold, and mash everything together until it becomes a compact mass. Cover the filling with plastic wrap and set aside for 30 minutes or refrigerate overnight, letting it return to room temperature before assembling the dumplings. Cut 50 small squares of parchment paper and lay them on baking sheets (you can also lightly dust the sheets with cornstarch to prevent sticking, but I didn’t find this necessary). To assemble the dumplings, hold a wrapper in one hand and scoop about 1 Tbs. or filling and place it onto the center of the wrapper, pressing down gently. Gather and pinch sides together to form a purse-like shape. Crown the dumpling with a pea and place on a parchment square. As you continue assembling the dumplings, place a clean dish towel over the assembled ones to prevent drying. If you are not cooking them immediately, cover them all well with plastic wrap and refrigerate for up to several hours or freeze on a baking sheet until hard, then transfer them to a sealable plastic freezer bag and keep frozen for up to 1 month; partially thaw them before steaming. To cook, set up a bamboo steamer basket in a pot of boiling water (the pot should just hold the basket without much space in the sides of the pot, and the water level should be just below the bottom of the basket) and place 6-8 dumplings on their parchment squares in each level, spacing them apart a bit to allow steam to flow around them. Steam 6 to 8 minutes, until the dumplings have puffed slightly and the wrappers have adhered to the filling and turned translucent. Transfer them to a serving plate. Serve immediately with small bowls of soy sauce mixed with hot mustard to taste, and steamed white rice. Beautiful! I love your photos too. They look so so so good! Delicious. Just delicious. Thank you for bringing these along for us all. I have never made dumplings or spring rolls and need to givei it a try. Your dumplings are beautiful and I love Shaomai or Gyoza or any kind of dumpling really. I could make them an entire meal. The combination of pork and scallop is wonderful. These look so beautiful. Yum! I really do love dumplings. What fresh and wonderful ingredients! Are you were to be very talented, especially for this kind of food??? It’s impressive Laura, they are perfect! Wow, Shumai!! Looks so good! I used to like those!! Last weekend, I had a dinner with my friend, and made GYOZA using vegetarian mince. Your post made me think that I shall try making veg version of it. Love the recipe and Andrea Nguyen. She is like an Asian food goddess. Your open faced shumai came out beautifully, Laura! Laura-san, These are adorable. I love your photos and presentation. I think I am going to pick some wrappers from the market. Absolutely good looking dumplings. YUM YUM YUM! We LOVE dumplings!!! How pretty!! And lovely, lovely food styling. Andrea Nguyen’s recipes are great, aren’t they? I’m a fan as well. Thank you for bringing these gorgeous bites to this week’s FF – Dame Edna herself couldn’t have done better! Happy Fiesta Friday and enjoy the party! I have never tried making dumplings. Your pictures are beautiful, and your instructions make me think I could even make them?